Today is a special day in the ongoing development of Sir Read-A-Lot. Recently, I have been approached by Hodder & Stoughton and HarperCollins who have asked me to publish pre-release reviews of titles they are about to launch and I have secured some extremely high profile guests who have kindly given me interviews and supplied books for a giveaway. Reading a good book is one of my great passions and that was one of the main reasons I began blogging. I am always surprised when I open the pages of a book and firmly believe getting lost in the world created by an author is the best way to relax, to escape from the pressures of life and enjoy something really special. As you may know, I am very selective about which books I choose to showcase on my blog. I do, unfortunately, reject more than I accept but I do not apologize for that. My aim is, and always has been, to promote the very best historical fiction novels and to share these wonderful stories with the world. 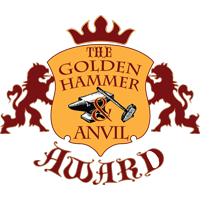 Taking inspiration from a quotation by John FitzGilbert, the father of "The Greatest Knight" William Marshal I am pleased to announce the golden Hammer & Anvil shield! Each recipient will have their name on my Roll of Honour, a new page that will be permanently on my blog, and receive a jpeg Award to place on their website. The award is open to books published by any author, whether they are represented by traditional publishing house, use an assisted publishing company or who have done the whole thing themselves. I will be presenting the award at my discretion, to books that I have reviewed and achieve my highest rating of 5 crosses. However, a 5 cross rating will not mean you instantly qualify for the Golden Hammer & Anvil Shield. It will only be given to books that are truly special; whose stories are impeccably crafted, where authors have taken care to ensure their manuscript is properly edited and prepared to a professional standard and where the story evokes thought and emotion long after the final sentence has been read. This award is all encompassing and includes e-versions and traditional hardback and paperback works. The Sower of the Seeds of Dreams by Bill Page. To me, this award recognises excellence in a time when the increase of print on demand and instant electronic publication has driven down the standard of writing. Too many sub-standard books have swamped the market and I hope the inception of this Award goes some way to redress the balance. I want to show that there are still wonderful books being published and highlight them in the manner they deserve. Congratulations to the first four winners! Very nice Stuart! Awesome way to reward those authors who have produced a novel that surpasses the standard. Congratulations on Hodden & Stoughton and HarperCollins asking you to review pre-released novels. It is an honour indeed. This is great! congrats to these authors! I'll have to look at the other three, which I haven't read, but I certainly concur that The Crown is an excellent read! Thanks for creating your award for worthwhile historical fiction. sounds cool congrats to the winners! Great! Congrats on your request for pre-release reviews and congrats to the award winners!